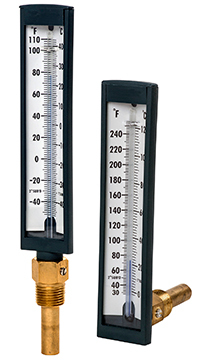 Our 5" industrial thermometers are small, compact, sturdy, cast aluminum glass tube thermometers. Featuring easy readability, small size, and adaptability, it's the perfect alternative to economical thermometers typically used in industrial applications. Dial scales are in both °F and °C. Model T-571 is a lower mount (LM) design with a brass bulb shield. Model T-572 is a lower back mount (LBM) design and has a brass bulb shield.